Write, write, write. That's what writers need to do. So to get me to write more and other things than just fiction I have decided to write reviews of books I have read. I am not going to go back and review stuff I have already read, only ones that I have finished recently. I use Goodreads to track and find new books to read as well as get reviews. It's a great social reading site focused solely on books and authors. Of course they have mobile apps to make it easier to get updates and suggestions on the go. My reviews are purely on the entertainment and story content aspect of a book. I am not going to focus too much on the style, writing capability of the work unless it's really bad and I will not get into the 'deeper' meanings trying to figure out what the author was trying to say. There are so many books out there and so little time to consume I read for absorption and entertainment, not for inner reflection or to find myself inside a fictitious world created by someone else. 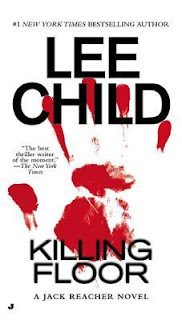 The first book up for review is an older book, but new for me as it's my first entry into a very popular series by Lee Child. The Jack Reacher novels. For years I have been hearing about the Reacher character from my father, family and friends. But I have invested myself into other large series and the way I am once I start and commit to a series, I like to read them all sequentially and not try to get two series going at the same time. Especially if the series are similar in subject matter, the characters then tend to get mixed up by which one is from which world. This is the first book in a long series by Lee Child. Jack Reacher is a 6'5", mountain of muscle and attitude. An ex-military police officer now wandering the country living off his pension trying to be as anonymous and off the grid as possible. We start out with Jack eating breakfast in a small Georgia town where he goes to research an old story about a singer that was killed there decades ago. However his plans change when he is arrested for murder. He claims his innocence and the mystery starts to build. Between prison and interrogation his innocence is realized by new, yet out of town, detective and Jack's own police background gets him inserted to investigate the murders he was arrested for as he unexpectedly is connected to one of the victims. The small town corruption, international ties, and a secret that people are going to great lengths to protect become more and more clear as Jack Reacher digs deeper until he breaks open the case and goes after everyone. This book is violent, descriptive, the story is complex and keeps you reading to see what happens next. There are 16 Jack Reacher novels and this being the first one you have to assume the character development gets stronger, the writing gets stronger, and the story constructs get stronger. There are faults in this book, but nothing to stop me recommending it if you are curious and want to get into the Reacher series. Why not start with #1? Like all adventure novels you have to go into this like an action movie, it's fiction, suspend reality expectations. The circumstantial and coincidental scenarios that Jack gets into happens in novels and not in real life. There are things in here that do not reflect reality, but who cares. That's why we read action/adventure novels, to be entertained. If you are looking for a real to life detective novel go get a non-fiction book on FBI cases or detective memoirs. If you want a hard knocks, action packed, violent action/adventure/mystery book then read this. The only other aspect of this book that is hard to get used to is that it's written in the 1st person from Jack's viewpoint. Some like it, some don't but it works if done right and this works but if you are not used to 1st person style it takes a while to get adjusted to it. I give Killing Floor 5/5 stars purely on the entertainment value as a story and the foundation of the Jack Reacher character. I will continue reading the Jack Reacher novels and will tackle the entire series over the next year, he's up to 16 books now. However I did alter my plan a little bit and am now reading the 1st book in Daniel Silva's series to see if that one grabs me harder. I heard Daniel Silva interviewed on the local radio station about his work and I was very intrigued by his approach to the world spy/terrorist genre which I love. So I am currently reading The Kill Artist and will decide where to go after that. I will get that book finished in the next few days and maybe try to start another one but I am eagerly waiting for Vince Flynn's new Mitch Rapp novel, The Last Man, to come out in November and I will read that in one sitting most likely. So many great books, so little time to read them all. It's OK to be picky.